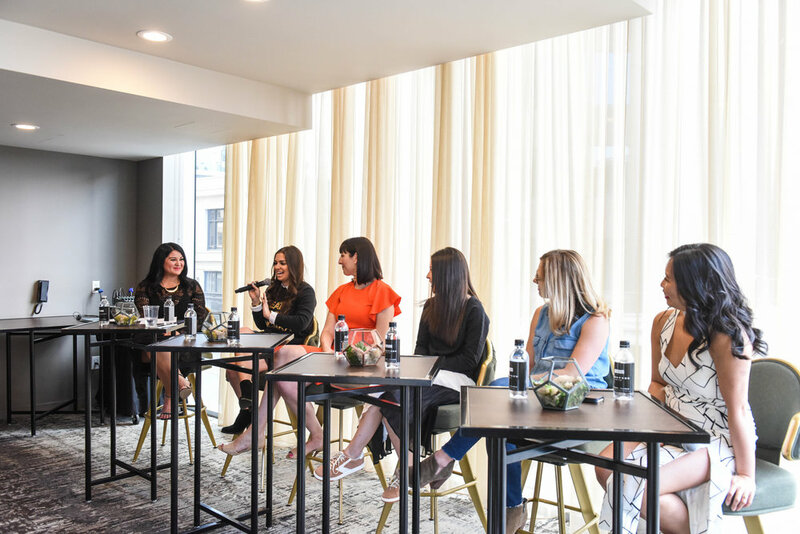 Last year Gossip & Glamour hosted over 100 of the top style bloggers in the city for a day of insight and inspiration at the annual Style Summit and we can't wait to do it again! At the event, we touched on everything from how to work with fashion brands, to how to ask for money, how to maintain an authentic voice when creating content, and most importantly, how to track metrics on paid collaborations. We featured a range of brands including Neiman Marcus, Brooks Running, Fitcode, and Julep and also turned the tables on some of our favorite social media personalities including Jess Estrada, Moorea Seal, Jenny Cookies, Tiffany Ishiguro, and Brandy Brown. We dove headfirst into the business of blogging and uncovered tools and techniques that would ultimately help bloggers in the Seattle market sign larger deals with brands and pave the way for long-term success. It was a power packed yet playful day, and the style bloggers who came offline for the event expanded their networks and sparked numerous creative collaborations that are still going strong today. It was at the Style Summit that Moorea Seal first announced she would be moving her storefront from Belltown to First Ave., and where Keynote speaker Alan Gertner of Tokyo Smoke announced that he would be expanding his brand to Seattle. At the event, Darcy Camden and Andrew Hoge dabbled with Facebook LIVE in the style summit greenroom and captured some rare and hilarious moments backstage with panelists. Stylists from Coupe Rokei Salon armed themselves with styling tools and makeup brushes to keep panelists looking fresh before heading on stage and raffled off an epic Smith & Cult beauty prize pack. The event ended with an after-party at The Nest, Hotel Thompson's rooftop bar where guests enjoyed photo opps and refreshments. The Style Summit is truly our favorite event of the year because it brings the community together in real life to connect, share ideas, spark collaborations, and learn coveted insight from brands. We can't wait to do it again this year in partnership with W Bellevue! Here's a link to more info: http://www.gossip-glamour.com/style-summit/. We will be announcing the first round of speakers and panel topics next week! "I was reminded how valuable real-life connections are!" said Neha of Neha Beauty. "We were excited to learn more about what's trending in the influencer world," said Daniella of The Fearey Group. "It was such an incredible experience to be surrounded in a room of like-minded, motivated and local hustlers," said Cortney of The Grey Edit. "Anytime a group of like-minded individuals comes together, it's empowering," said Kelsey of the style blog Kelsey This Year. "My biggest takeaway from the conference is that life is way more meaningful if you take on a big challenge, work hard, and cultivate deep relationships," said Angela of NW Healthy Mama. See you this spring at W Bellevue! The 2nd annual Gossip & Glamour Style Summit is a wrap! We had a blast hosting over 100+ of the top style bloggers in the city at The Thompson. The panel discussions were filled with insight and inspiration and offered bloggers coveted behind-the-scenes strategies for long-term success. The first panel discussion, "The Art of Creative Collaborations: Strategies for working with fashion brands to maximize engagement" touched on how to secure paid collaborations, how to pitch in reverse, and how to track ROI on influencer partnerships. Featured panelists included Jessica Branning of Neiman Marcus, Danielle Pepperl of Brooks Running, Stephanie Chacharon of Fitcode, Sammy Scharg of Julep, and to round out the panel and offer a blogger perspective, we tapped Jess Estrada of FreshJess.com. "We want to work with bloggers who already understand our brand and ethos," said Sammy Scharg of Julep. That was a sentiment echoed by other brands on the panel including Danielle Pepperl of Brooks Running who gets inquiries for product all the time. Brands want bloggers to know that if they're asking for free product from a brand, they'll have an easier time getting to a "yes" if they've already done their homework about who the brand is and who they're trying to target. When it comes to paid collabs, brands admit they don't always have a budget to pay bloggers but when they do, they go straight back to the influencers they worked with in the past who took their unpaid collabs seriously and who organically love the brand, regardless of whether or not they were getting paid to post. They also noted that professionalism goes a long way in person and via email. "If we feature you at an in-store event, don't be late!" said Jessica Branning of Neiman Marcus. Typos are a major no-no and so is "going dark" via email. If you're too hard to track down brands will just find someone else to work with who is more responsive. Other nuggets of advice from the panel included following up with brands when your collab is over, offering metrics and feedback from readers, avoiding conflicts of interest by not tagging competitors in the same post, and reaching out to PR firms that work with brands you love in order to get connected. The second panel "Beyond the Blog: How to successfully launch a second concept" focused on launching a business and/or adding a second revenue stream. Sponsored posts can only go so far and in the year ahead bloggers will need to add additional sources of revenue to stay afloat. Panelists included Moorea Seal, Jenny Keller, Brandy Brown and Tiffany Ishiguro. The discussion covered how to grow a loyal following, how to know when it's time to supplement your team with people who love doing the things you don't (like spreadsheets), how to use your network to build your brand in the early days of launching a business, and most importantly, how to diversify your revenue stream by building on the things you've already created. "Whenever I'm trying to figure out if I should do something or not I always ask myself: Does it make money? Will it be fun? Is it good for my brand?" says Jenny Keller of Jenny Cookies, "It has to be two out of the three in order for me to do it." Jenny got her start by getting noticed by Tori Spelling by having a friend take some cookies to a book signing in Hollywood. She was later contacted by Tori via Twitter and the rest is history. Jenny now has a bakeshop in Lake Stevens in addition to being an author and influencer on her own site at JennyCookies.com. Tiffany Ishiguro talked about the importance of leveraging your network to build your business. In the early days of building T+J Designs she was on a photoshoot with a fellow style blogger who later introduced her to the accessories buyer at Nordstrom. T+J Designs ended up getting featured by Haute Look, which instantly helped elevate the entire brand. Brandy Brown of Marabou Designs discussed the importance of knowing your value and getting paid for doing the things you love. She also noted that if you don't want to be the one negotiating fees or signing contracts, find someone who can do it on your behalf so that you aren't missing opportunities to grow your brand. Moorea shared strategies for building an engaged following via social media and spoke about the importance of selling direct to the customers in order to enhance the buying experience. She also dropped a major bombshell by announcing that she's moving her shop in Belltown to First Ave. later this summer. Other tips for success included being open to collabs with like-minded brands that may be outside of your niche. Jenny Keller looked beyond baking to do collabs with Minted.com and other lifestyle companies that fit under her brand umbrella. Tiffany discussed diversifying her revenue stream by adding a wholesale component to her business, and Moorea spoke about going direct-to-consumer after building a strong following on Pinterest by directing traffic to her own site instead of a third-party. Keynote speaker Alan Gertner of Tokyo Smoke wrapped up the event with an inspiring keynote speech about winning at life by doing work you care about with people you care about. He also announced that he's open a Tokyo Smoke concept shop right here in Seattle later this year. Stay tuned for details + an exclusive invite to the preview party. I want to say a heartfelt thank you to everyone who helped make the Style Summit possible including our advisory board who truly made the event seamless. Teamwork makes the dream work and I am eternally grateful for my tribe. It has been a privilege watching the style blogging community in the city grow and evolve over the past few years. The Style Summit started as a passion project and grew into a platform for bloggers to connect, share ideas, and spark creative collaborations. I can't wait to bring it back again next year! We invite you to follow the conversation on social using the hashtag #SEAStyleSummit. You can also view official event photos here. If you missed the Style Summit this year, please be sure to sign up for the Gossip & Glamour mailing list to stay in the loop on next year's event! Nine amazing panelists will take the stage at the Gossip & Glamour Style Summit on Saturday, March 25th at Thompson Seattle to share their insight on the state of fashion blogging and discuss how influencers can strategically navigate the opportunities that lie ahead. Guests will get to mix and mingle with our featured panelists at the event and have the opportunity to ask questions during Q&A segments. The Style Summit is officially sold-out, so follow the fashion conversation on social media using the hashtag #SEAStyleSummit. Guests can also tweet questions for panelists to @GossipGlamour using the event hashtag. Tiffany Ishiguro is the co-founder and designer of T&J Designs, a clothing line and e-commerce site that she proudly owns with her sister, Jen. She started her style blog, I am Style-ish, a few years prior to launching her business and did $1M in sales within the second year of business by using a mix of social media, networking, and non-traditional marketing. Stephanie Chacharon is the Director of Marketing at Fitcode. She's responsible for all of Fitcode's marketing and PR initiatives, including collaborations with more than 70+ influencers across the major US markets. Stephanie has 10+ years of digital and content marketing experience, ranging from marketing strategy and execution to brand development and content creation. Moorea Seal is the founder of mooreaseal.com and the storefront in Seattle, highlighting over 160 handmade designers from across the US. Her company donates 7% of all proceeds to a rotating list of non-profits. She's the best-selling author of The 52 Lists Project and 52 Lists for Happiness, both titles reached the "Top 30" list of books on Amazon and received praise from numerous media outlets including O, The Oprah magazine, Refinery 29, Elle, The Huffington Post, and more. Her third book, Make Yourself at Home, will make its debut this fall. Sammy Scharg manages PR and top-tier influencer relations for Julep. She is a proud alum of Michigan State University and holds a BA in Communications with a specialization in Public Relations. During college, Sammy held internship positions with numerous brands and publications including Rent The Runway and Marie Claire magazine. Upon graduating, Sammy worked as the head publicist for New York & Company and managed celebrity partnerships with actress Eva Mendes and singer/actress Jennifer Hudson. She is well-versed on industry trends and enjoys traveling in her free time. Jessica Branning is the Public Relations Manager at Neiman Marcus in Bellevue. In her 12-year career with the company, she has produced numerous fashion events and runway shows for top designers. Jessica moved to the Pacific Northwest in 2013 from the Las Vegas Neiman Marcus store and enjoys working with media outlets and fashion influencers on luxury fashion stories. She regularly produces fashion events at her store in Bellevue including the Neiman Marcus CUSP events and seasonal designer trend runway shows. Jenny Keller, also known as "The Baker to the Stars", is a coveted entertaining expert, baker, and crafting stylist. She is internationally known as a creative baking mastermind in the art of dessert tables. Jenny's work has appeared in numerous publications including People, US Weekly, Brides, OK!, Life & Style, InTouch, and more. Jenny's blog, Jenny Cookies, shares styling tips, recipes, DIY crafts, and behind-the-scenes secrets of her work. She is the author of the popular cookbook Eat More Dessert and owner/operator of the Jenny Cookies Bakeshop in Lake Stevens, WA. Jess Estrada of FreshJess.com is a sought-after writer, strategist, and public speaker, focused on personal branding, social media, networking, and blogging. She created her site back in 2008 to offer a unique perspective on life, health, and style in the Pacific Northwest. By day she works as the digital media manager for the Bezos Family Foundation. Her work and likeness has been featured in SELF magazine, the Independent Fashion Bloggers (IFB) Community, Fitness Magazine, Teen Vogue, Seattle Met magazine, and more. She has been featured as a contributing influencer in Simply Measured's Brand Guide To Working With Influencers and has worked with a variety of fashion and lifestyle brands including Starbucks, Airbnb, Filson, Pendleton, Blue Nile, The Seattle Art Museum, MoPop, and more. Brandy Brown is the Founder and Creative Director of Marabou Design, an innovative design studio located in the beautiful Pacific Northwest. Specializing in creative styling, editorial, and graphic design, Brandy describes her aesthetic as both playful and smart. Brandy has been a blog contributor to numerous life and style sites, and has been featured by Martha Stewart Living, Essence, InStyle, Domino, and more. Brandy enjoys sharing tips and tutorials for the modern family and their extraordinary friends. Danielle Pepperl is the Global PR Manager for Brooks Running, where she is responsible for developing strategy and overseeing execution of all external communications including event management, corporate storytelling, executive speaking opportunities, and media relations. As part of her role, Danielle has oversight over the company's Blog Ambassador and Influencer programs for both Brooks Running and Brooks Heritage. Prior to her role at Brooks, Danielle spent time honing her PR skills at Amazon and Waggener Edstrom. She graduated from The University of Washington with a Bachelor's Degree in Communications. Don't miss out on valuable insight from these amazing panelists at the Style Summit! Follow the LIVE conversation on Twitter using the hashtag #SEAStyleSummit. You'll also want to check out our Facebook LIVE Feed on The Gossip & Glamour FB Fan page hosted by Darcy Camden of Styled Seattle. Happy New Year fashion friends! Gossip & Glamour has big plans for 2016 and we can't wait to fill you in on what's ahead! We always strive to give back to the fashion community by welcoming interns to come and experience what goes on behind-the-scenes in the world of fashion PR. This year, we are pleased to announce that our internship program will transform into a fashion mentorship program, allowing students to fully immerse themselves in the field. Our program will allow students to learn key concepts in a safe and structured environment where they can ask questions, receive constructive feedback and focus their learning on specific areas of interest within the fashion industry. We run 12-week internship programs each quarter (Spring, Summer, Winter, Fall) and can't wait to share success stories of interns who have worked with us! For some, fashion may seem frivolous but at Gossip & Glamour, we know that fashion has the power to support some really amazing causes. In 2016, we will focus our charitable giving and volunteer service hours to the YWCA's Dress for Success Program in Seattle. Back in 1998, Fashion Group International provided the seed money for the YWCA to fund the local chapter of Dress of Success and we can't wait to continue to support the program by offering women in need the opportunity to put their best foot forward. In addition to volunteer hours on-site at the YWCA, attending the annual INSPIRE Luncheon to lend monetary support, we will also be strategically utilizing Gossip & Glamour events to collect donations of gently-used shoes and handbags. Please join us in supporting this worthy cause! 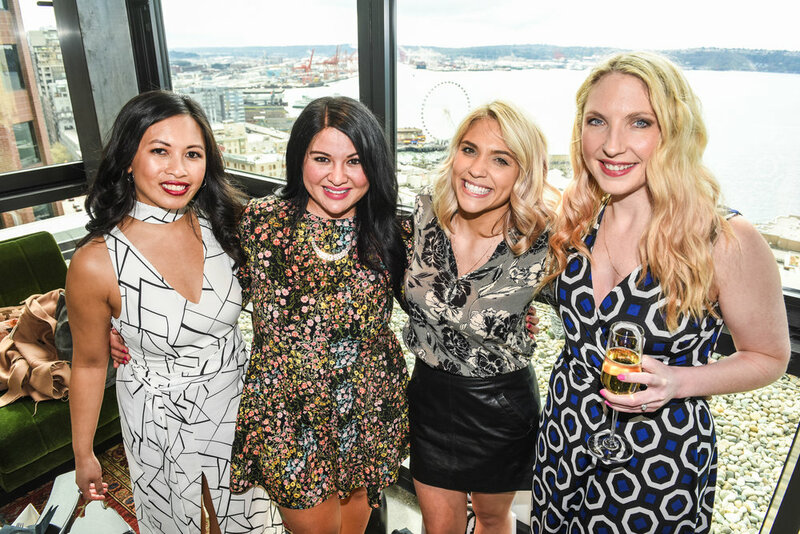 The venue has been booked and the date has been set for the first-annual Stylish in Seattle spring summit for fashion bloggers in the city. We are very excited to bring the style blogging community together to connect, collaborate and learn valuable insight from top fashion brands at our half-day summit. A line-up of speakers and a link to buy tickets is coming soon. We hope you'll join us and be part of the conversation. Please save the date: Saturday, March 19th.